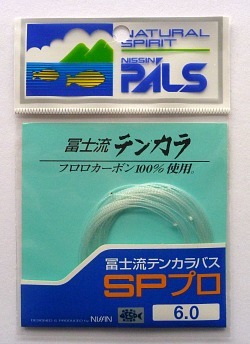 Nissin PALS SP Pro lines are tapered twisted fluorocarbon tenkara lines. The density and the taper work together to give pinpoint casts even in a bit of a breeze. I'm sure by now everyone knows that I'm a level line guy and have not been a big fan of furled lines. Level lines are easier to hold off the surface, which to me is the essence of tenkara. However, different people view tenkara differently and value different aspects of this gentle sport. I find it interesting that as more American tenkara anglers visit Japan and are exposed to more Japanese tenkara anglers, the narrative has gradually changed from "this is tenkara" to "find your own tenkara." A lot of people here, finding their own tenkara, find they like furled lines. They cast extremely easily. They even cast pretty easily into a breeze. They seem to be a little more accurate, particularly when used with the stiffer rods, where you can put a bit more punch into your cast. Also, now that people are exploring longer rods, the 5+ and 6+ meter keiryu rods, they find that a furled line does very well at the longer lengths. When I took a two handed casting class from Fred Krowchenko of Spey Casting North East, we tried a number of different lines, and while even light lines worked well if they were no longer than the rod we were using, once we got to longer lengths, the one line that surpassed all others was a twisted fluorocarbon line made by John Vetterli in Salt Lake City. Now I have the Fuji Style Tenkara Nissin PALS SP Pro twisted fluorocarbon line, and while my first thought was that John had met his match, it would be more accurate to say John has met his master. On his latest trip to Japan, John met Hiromichi Fuji, one of the true tenkara masters in Japan, who personally makes all of the Nissin PALS twisted tenkara lines. He showed John the machine on which he makes them and gave John some pointers for his own lines. If you need a custom line made specifically for a certain rod, John's your guy, but if you are just looking for a furled line that has the density of fluorocarbon and the taper designed by a master with decades of experience, then the Hiromichi Fuji has the line for you. The lines are available in different lengths, depending on your rod. The shorter ones will work very nicely with the Daiwa 33SF through 39SF rods, which many people find a bit stiff for level lines. The lines are not too heavy for the Nissin 7:3 tenkara rods, and balance nicely with the Air Stage Fuji Style Tenkara rods (the ones with the wooden grips) that were also designed by Hiromichi Fuji. There is no shortage of furled tenkara lines that you can choose. They come in a wide range of colors, lengths and materials. These, though, are made by the master. To use the PALS SP Pro line you need to have a knot in the end of your lillian. The line has a unique attachment method. 1. 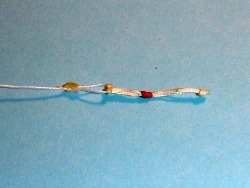 There is a small loop with a red thread tied around it. 2. 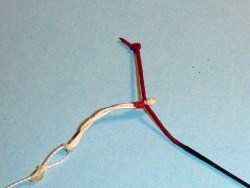 Insert the lillian through the small loop, between the red thread and the end of the loop. 3. 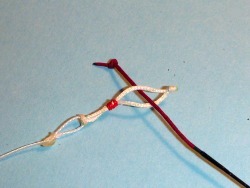 Slide the red thread so that it is tight against the lillian. 4. Slide the loop down to the knot in your lillian. The connection is very secure. 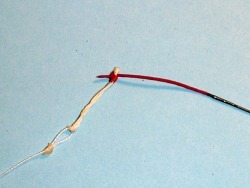 Make sure you do not bend the rod tip to the side when you are attaching or removing the line.